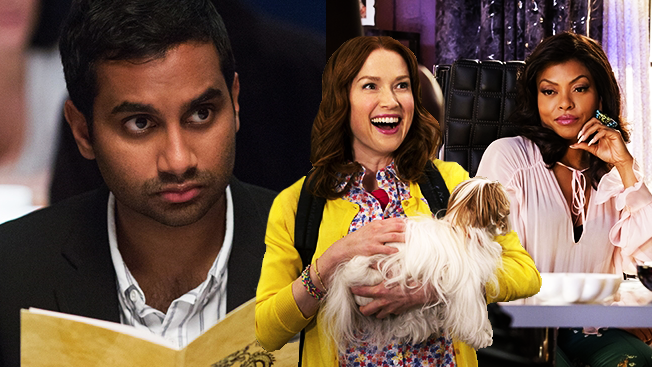 On Tuesday, I shared my picks for the best shows of 2015. With so many superb returning and concluding shows, only one new series managed to crack the list. Yet 2015 was actually a splendid year for freshman shows despite a weak fall season. This year’s overabundance of quality TV warranted a second list featuring the best new programs from broadcast, cable and streaming outlets. It’s no surprise that streaming has the largest representation on the list (four shows in total, plus five more that narrowly missed the cut). Netflix, Amazon and Hulu have all taken ambitious swings to entice audiences with exciting original series that rival anything on cable or broadcast. As overwhelming as your TV choices already are, these newbies (which you can catch in our supercut below) are more than worth making time for. Here’s hoping their second seasons are even stronger. The Grinder is proof that a comedy pilot is little more than a work in progress. The first episode had an interesting premise (an actor who played a lawyer on TV returns home to work at his family’s real-life firm) and game actors (Rob Lowe in the lead and Fred Savage as his uptight brother), but its pieces didn't quite fit together. Since then, the show has grown funnier and more confident with each passing week as Lowe and Savage have evolved into a spectacular comic duo. While other fall pilots started stronger, The Grinder has overtaken them to become broadcast’s best new show this fall. Just seven days into 2015, Empire burst onto the scene. And it just might have saved broadcast TV in the process as it became the biggest network hit in more than a decade. Cookie, Lucious and the Lyon family gave audiences the outlandish soap opera they've been lacking for years, along with sensational music. Its buzz may have slightly cooled this fall, but Empire remains red-hot—and don’t ever mess with Taraji P. Henson’s Cookie! After wrapping the final season of Parks and Recreation (which made my Best of 2015 list), Aziz Ansari didn't lose a step, channeling Woody Allen in his heyday with his innovative comedy about a thirtysomething actor (Ansari) exploring life and love in New York. It's real without ever seeming condescending. Ansari and co-creator Alan Yang also give entire episodes over to exploring life from the perspective of Ansari's parents (played by his real-life mom and dad) and other elders, a point of view that is sorely lacking from most shows. Between this and Black-ish, ABC is proving to be a wonderful home for comedies with very specific voices—featuring cultures that are shamefully underrepresented on TV— that still manage to hilariously touch on universal themes. Last year’s midseason entry Fresh Off the Boat found its rhythm from the get-go, rare for a comedy, and has only gotten better this fall in Season 2. Meanwhile, series MVP Constance Wu has quickly become one of TV's funniest actors and already secured a spot in the pantheon of classic TV sitcom moms. So much more than just another superhero show, Jessica Jones features the first heroine worthy of Buffy the Vampire Slayer's mantle. As a Veronica Mars-like private detective with superpowers, Krysten Ritter excels at both being a badass and burrowing into the emotional trauma and fallout from her forced dalliance with the chilling characer Kilgrave (David Tennant). Between this and Daredevil, Marvel and Netflix have developed a potent partnership, which makes me even more excited for their next collaboration, Marvel's Luke Cage. You’ll never look at The Bachelor the same way again—which in itself is a treat—in the first Lifetime series I've ever watched regularly. This groundbreaking drama from former Bachelor producer (and Wieden + Kennedy alum) Sarah Gertrude Shapiro punctures the "happily ever after" facade of those romantic competition shows. And it introduces two of 2015's strongest female characters in Shiri Appleby's damaged producer and Constance Zimmer's cutthroat executive producer. NBC has made a lot of mistakes in recent years when it comes to comedy, but one of its smartest decisions was wisely letting Netflix nurture and grow its Tina Fey-created comedy about a woman (Ellie Kemper) who is rescued after spending 15 years in a doomsday cult and starts her life over in New York. Fueled by Kemper’s infectious optimism, Kimmy Schmidt returned us to Fey and co-creator Robert Carlock’s manic 30 Rock sensibility—plus it had the year’s catchiest theme song (“they alive, dammit!”). What was Vince Gilligan thinking, daring to mess with Breaking Bad's perfection by creating a prequel about Bob Odenkirk’s Saul, then known as Jimmy McGill? As usual, Gilligan was several steps ahead of us, turning Better Call Saul into a show equally addictive and engaging as Bad was in its early seasons. Bravo to Odenkirk and Jonathan Banks (returning as Mike Ehrmantraut), who expertly navigated every challenge Gilligan and co-creator Peter Gould threw at them. Amazon’s post-Transparent offerings were mixed at best, until the service quietly debuted this uproarious comedy about a Boston ad guy (Rob Delaney) who hooks up with an Irish schoolteacher (Sharon Horgan) during a business trip to London and decides to make a go of their relationship after she gets pregnant. Profane, outrageous and hilarious, Catastrophe was this year's biggest surprise. And with just six episodes in Season 1, you can binge it in two and a half hours! As the only new series to also land on my overall top 10 list, this drama captivated viewers from the start and never let go. Creator Sam Esmail’s confident leadership (I still marvel at his Ali-worthy rope-a-dope, in which he telegraphed a big Rami Malek/Christian Slater plot twist, only to blindside us with a second jawdropper we never saw coming) and Rami Malek’s breakthrough performance as Elliot combined for a revolutionary series. It's one that has redefined “ripped from the headlines.” Season 2 can’t arrive quickly enough. These new shows, which came oh-so-close to making the list, have also been wowing me from the start: Casual (Hulu), Crazy Ex-Girlfriend (The CW), Difficult People (Hulu), The Man in the High Castle (Amazon), Marvel’s Daredevil (Netflix) and Supergirl (CBS). Come back Thursday, when we’ll shift from the year’s best to its worst, looking at the most disappointing shows of 2015.